Confession time. Up until now Foodie Loon has been the one in charge of lighting the BBQ. Having finally fully read the instructions for myself I wanted to be at the coal face. On the menu for Day 5 was Pizza. I wasted far too long scouring the internet, watching You Tube videos and reading blogs about how to best do Pizza on the BBQ. I already had a pizza stone so was all set. A sweet pepper harvested from the greenhouse was to have pride of place in addition to tomato, pepperoni, ham, red onion, mozzarella and parmesan. 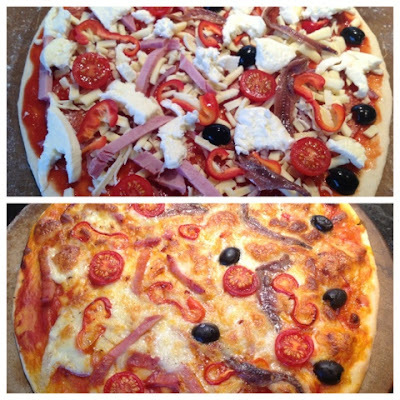 Olives and anchovies on my side only. Some people are so fussy. I piled up my coals, lit them and let them burn for 30 minutes until they had a light coating of ash. Next I carefully arranged them for direct cooking and placed my pizza stone topped with pizza on the grill. I didn't peek under the lid but I could see that the temperature was dropping rapidly and all was not well. Stupidly when I had cleaned out the ashes I had left the vents on the bottom of the bowl closed. No air = no fire. Oven to the rescue. Pizza still looked and tasted great. Day 6 and back on track with the sun still shining and the vents fully open. 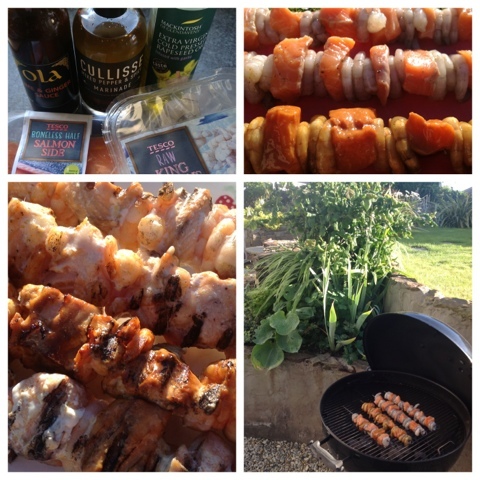 Seafood on the menu with salmon and prawns marinaded three ways. Ola Oils Lime and Ginger Sauce, Cullisse Mixed Pepper & Spice Marinade and Mackintosh of Glendaveny Rapeseed Oil Infused with Garlic. The grill was hot and the kebabs were tasty. 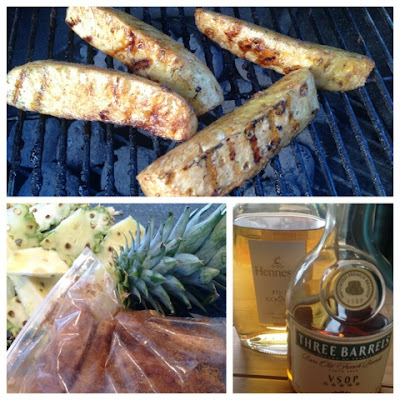 I spotted a blog post from Elizabeth's Kitchen Diary about BBQed Pineapple and it sounded too good not to try. Girl was swiftly dispatched to the supermarket to purchase a pineapple which was cut into eighths and marinaded in brown sugar and cinnamon. Boy was it good. After the first slice I had an even better idea - BBQ'd Boozy Pineapple. Too late to add alcohol to the marinade mix so I used some Brandy heated in a ladle and poured it over flambé style. Awesome. Day seven and the last meal of the challenge. It had to be something special and I opted for Beer Can Chicken. You Tube videos and blog posts a plenty on the best way to do this. My beer can was actually cider as I only had bottled beers. You need to open the can and drink half before you start. Not too much of a hardship. The can is then placed in a holder and the chicken manoeuvered over the top at which point it looks somewhat comedic. I rubbed the skin with olive oil and Spicentice peppery rub. 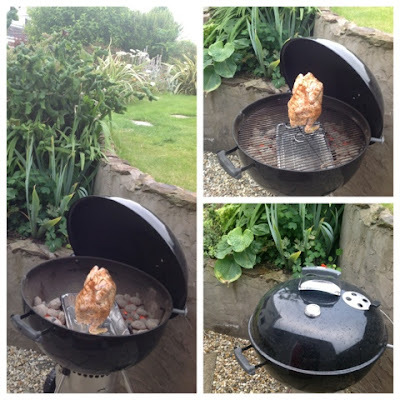 To cook a whole chook I needed to use the indirect method of BBQing. For this the coals were heated for 30 minutes until they had a light coating of ash. Next they are placed to the side of the food not directly under it. A foil drip tray catches any juices. Slight panic when I placed the chicken on the grill and the lid wouldn't close. I'm sure the instruction book never mentioned that I would need to remove the cooking grate. My research suggested that a whole chicken would need between 75 and 90 minutes to cook. I resisted temptation to take a peek until it had been in for an hour and I topped up the charcoal as recommended. Very good smells going on at this point. To accompany our last supper I filled my trug with new tatties, peas and parsley from the veggie patch. 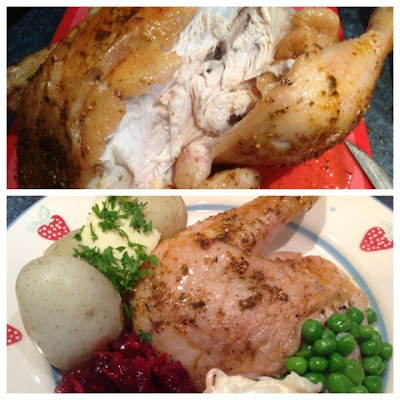 After 90 minutes the juices seemed to be running clear but I also used a meat thermometer to check that the internal temperature had reached 74 degrees and we were good to go.The resulting chicken was amazingly moist and juicy but I was a wee bit disappointed that the skin wasn't crispy. It did taste fantastic with the homegrown tatties, peas and parsley. Would definitely make this again and it's certainly a talking point. So the week is over and there have been successes and failures and a very steep learning curve. We were so lucky with the weather as only on the final day was there a bit of drizzle when we were cooking. I've still got a wish list of things I want to cook and never got round to. Dirty steaks being at the top followed with Chocolate Brownie Oranges for dessert. Side affects of the challenge included stinking of smoke and a new found addiction to BBQ videos on You Tube. I've also got a wish list of must have accessories. 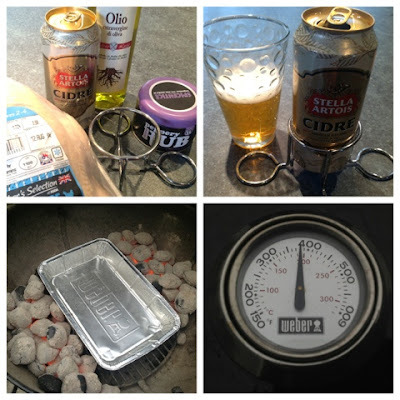 The first is my own beer can chicken holder (the one we used was borrowed from a friend) I definitely need a proper BBQ mitt or gloves as had a few hairy moments when I discovered that domestic oven gloves are as much use as a chocolate teapot in BBQ situations. Quite fancy one of the swanky Weber chimney starter's to get things going quicker. A whole world of BBQ shopping opportunities is out there. 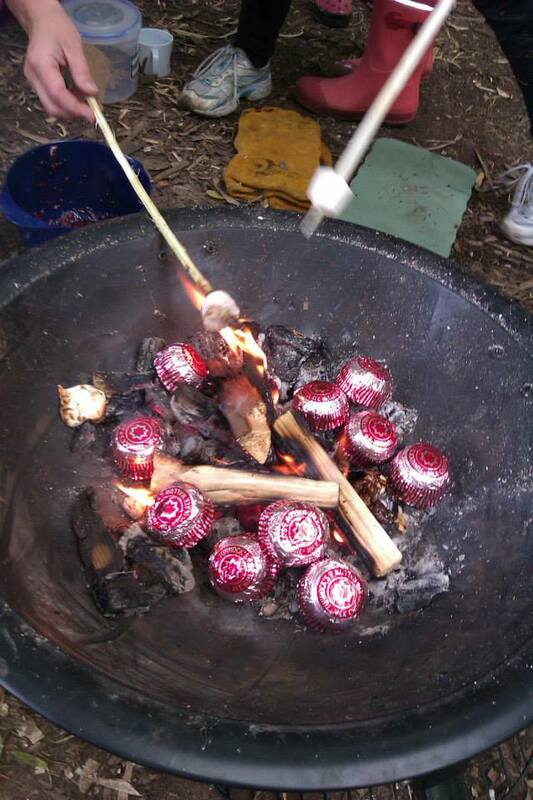 I'm really chuffed to be able to share this fantastic photo of Scottish S'mores being cooked up by kids at Kincardineshire Forest School. Their leader Dawn spotted the BBQed Tunnocks Teacakes on my previous post and instantly added them to their outdoor menu. They went one step further accompanying them with wild raspberry coulis also cooked on the fire. 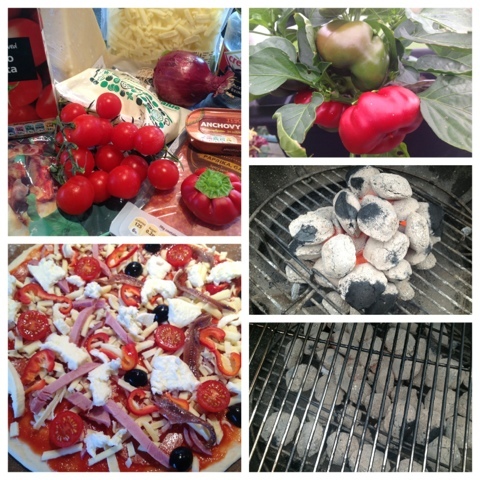 Alfresco cooking at its absolute best. Now I have a slight problem. When I was approached by John Lewis about taking part in this challenge I fully expected not be swayed from my trusty gas BBQ and foolishly promised friends that they could have the charcoal one once the week was over. Big mistake. I have turned to the dark side. Charcoal covered fingers and all. Any volunteers to tell them the bad news? 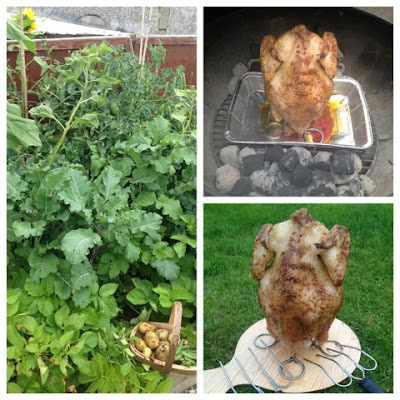 Very brave to attempt a whole chicken on the BBQ -- I've always been too caution for fear of under-cooking and all the nasty bugs that come with that. For me, I opt for a split cooking method -- I know it defeats the purpose but I feel safe. I ask my butcher to spatchcock a whole chicken. I poke some metal skewers through it to keep the flattened shape and cook the chicken in a conventional oven. I finish it off in the BBQ for all the smoky taste and crispy skin. I was slightly concerned hence why I used a meat thermometer. I stuck it into every possible bit of the chicken to ensure it had all reached the magic number! 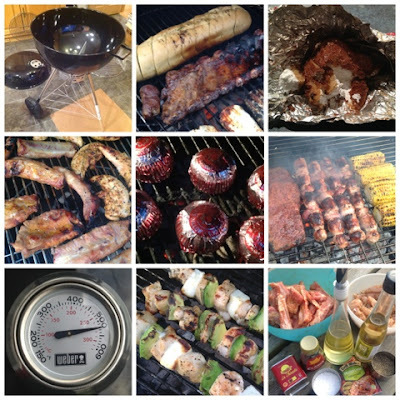 It sounds like you had a fantastic week experimenting with the new BBQ. Everything looks so lovely and mouthwatering, especially the cider can chicken! Mmmmmm! So glad you like the bbq pineapple and the boozy addition sounds just perfect! Thanks for the inspiration. The booze takes it to a whole new level. You must give it a try. Love the pizza :) Great idea!